Power conversion is the process of converting electric energy from one form to another, such as changing the voltage to adapt to the needs of an electronic device. During this process, transistors amplify or switch electric signals and electrical power, for example conversion from alternating current to direct current. In modern medium-voltage power conversion systems, solid-state switch and diode losses limit the maximum switching frequencies. At lower frequencies, transformers and converter filters can weigh up to several tons, which increases system and installation costs, and limits design flexibility in conventional and renewable energy applications. There is a need for high-voltage (>10 kV), solid-state solutions capable of switching at high frequency (1-20 kHz) and scalable to high currents. This development can lead to highly efficient, lightweight, multi-megawatt/multi-kilohertz power conversion systems for use on the electric grid. The team led by General Electric (GE) Global Research will develop a new high-voltage, solid-state Silicon Carbide (SiC) Field-Effect Transistor (FET) charge-balanced device, also known as a "Superjunction." These devices have become the industry norm in high-voltage Silicon switching devices, because they allow for more efficient switching at higher voltages and frequencies. The team proposes to demonstrate charge balanced SiC devices for the first time. 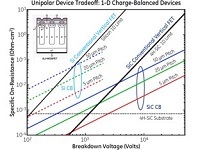 Their approach will offer scaling up to 15kV while reducing losses for power conversion applications by 10x when compared with existing silicon bipolar devices and competing SiC approaches. This will enable highly efficient, medium-voltage, multi-megawatt power conversion for conventional and renewable energy applications. The technology could dramatically reduce energy consumption and emissions for applications such as solar, wind, mining, oil and gas development, and medical devices. If these efficient devices were widely adopted the technology could save enough energy to power 5.9 million homes annually. It can also have a significant impact on medium voltage drives for high-speed motors and transportation applications, including hybrid and electric vehicles. In rail applications, the higher voltage and higher frequencies afforded by SiC devices could reduce the total energy consumption by as much as 30%. If successful, innovations from GE's project will enable highly efficient, medium voltage, multi-megawatt power conversion. This program will enhance U.S. technological leadership and manufacturing of SiC power devices. If widely implemented, this technology would dramatically reduce energy consumption-related emissions. Innovations from these devices can save enough energy to power 5.9 million homes annually and save businesses and homeowners money on electricity.